With the clock ticking I have a "bucket" of things to do and see before leaving. 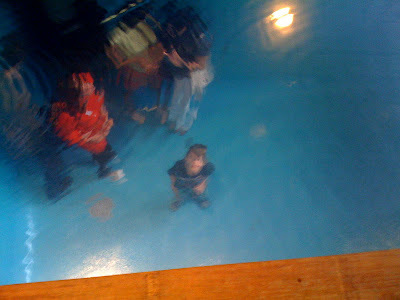 On this day, it was Leandro Erlich's cool Swimming Pool at PS1, followed by a Solstice Celebration at Socrates. Bucket metaphor courtesy of J-Dalt. These last days before setting sail feel super-saturated. Each experience—a ride over the Williamsburg Bridge, a swim in the Met Pool, a drink with a friend, a trip to the health food store—feels like it could be the last of its kind. In some cases, it’s the literal truth. It is a blessing because it forces me to really pay attention, to take every interaction seriously. There’s no time for messing around. The impending move is like a Sword of Damocles and it’s quite good really, forcing me to do—and say—the things I should have a long time ago. I too often chose to bide my time, luxuriating in the knowledge that whatever it was could always wait. Perhaps a riper moment would come along later. While each thing has its season, that can be a dangerous posture, an excuse that can be extended over and over until offerings are taken off the table, or we’re no longer in a position to accept them. So it’s better to do things right away and not wait unless there is a very good reason. Besides, an urgent life is richer, as I am now seeing so clearly. Small things take on a special value—an importance that is always there but too easily overlooked or taken for granted. Even my dreams have been really beautiful, rich and memorable. They make sleep an even greater pleasure than normal. Yet, when morning comes, I don’t want to miss a thing so I wake up super-alert and ready for another day and the sword that much closer. That’s how I live all the time, but the sword certainly clarifies things. we miss you guys! I hope you are settling in happily.